December 6, 2015 By heather 10 Comments This post may contain affiliate links. Read my disclosure policy. Bacon Wrapped Water chestnuts are by far one of the most requested appetizers from friends. Water chestnuts wrapped in bacon slathered in a brown sugar glaze, these tasty bites are always the first thing to go at a party. 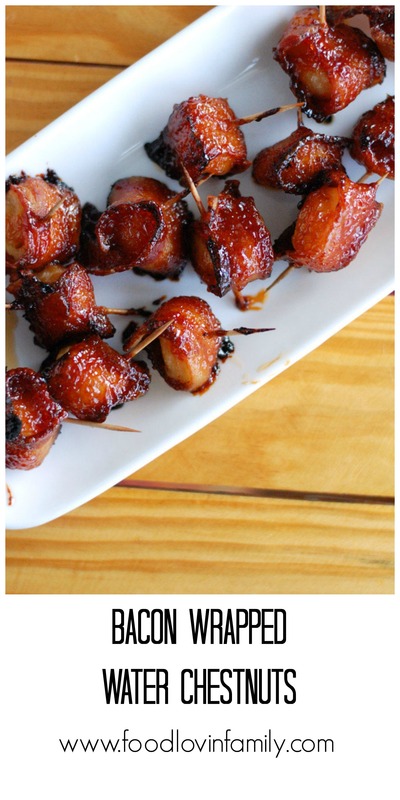 Bacon wrapped water chestnuts are in the top 3 of my favorite appetizer list. I feel like I say this all the time but…”stop what you are doing and make you a batch of these amazing things!”. Seriously, I just made some for my sister and brother-in-law, and I think we all could have had our own batch. Have you ever wondered, what do I do with the can of water chestnuts in my pantry. Make these! Last year around this time I was invited to my friend’s house for a ladies night. All the girls brought over a dish to share. My friend decided to try this recipe from one of her other friends, bacon wrapped water chestnuts. I had never had a bacon wrapped water chestnut but after that night, I knew they would be a holiday tradition in my house. OMG, the salty sweet goodness of these is beyond words. They are easy to put together and do not require many ingredients. These would be perfect for the upcoming holiday parties and even the super bowl. My only recommendation is to make 2 batches of these right off the bat. They will get eaten very quickly. Cut the bacon slices in half and then wrap one slice around 1 water chestnut. Put toothpick through the bacon and water chestnut to secure the bacon. Prepare a foil lined cookie sheet and place the water chestnuts on the pan. While the bacon wrapped water chestnuts are baking, add the ketchup, brown sugar, and Worcestershire sauce to small sauce pan. Cook on medium heat until brown sugar dissolves, about 5 minutes. After 25 minutes, take out water chestnuts and cover them with the sauce. Bake again for 25 minutes. Serve warm. I just made these for a neighborhood holiday party. I made three batches and it couldn’t have been easier. I got so many compliments and they were the first dish to disappear! Highly recommend. So happy everyone liked them! Is there a way to make these ahead of time and reheat? I think they would be ok to reheat. I think I would reheat them in the oven when you are ready to eat. You could even wrap the bacon around the water chestnuts and then bake them with the sauce the next day. Looks good! Do the chestnuts have to be from a can or can you use fresh ones from a airtight bag? Are they the same? Can you just use the sauce as a dipping sauce instead? Yes, use the water chestnuts in a can, they are different then the ones in a bag. You can definitely use the sauce as a dipping sauce instead. 🙂 Hope you enjoy them!! I have made these for years…I actually cut bacon in thirds with kitchen shears..I don’t heat the sauce I just mix in measuring cup until sugar dissolves and pour over chestnuts and bake again…these are my go to for every family gathering or trip to a winery with the girls…never leftovers…darn.. I made these for Thanksgiving appeziter. I tested the recipe first. I found that when I cooked them following the recipe the bacon got soggy. So I cooked them without the sauce and made the sauce for dipping. Everyone loved them.